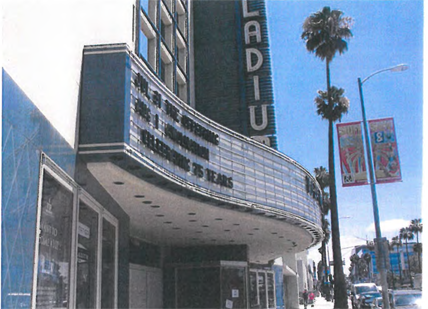 The Palladium is located at the northwest corner of the inter-section of Sunset Boulevard and North El Centro Avenue. Constructed by Hollywood producer Maurice Cohen in 1940 in the Streamline Moderne style, the building consists of a one-story structure with a full height mezzanine constructed of board-formed concrete. It has served as a historic venue for countless musical performances. The main facade along Sunset Boulevard features a central vertical blade type sign tower with the name “Palladium” spelled out in neon lit letters.